While you wear the Buds of The Ear, you gain advantage on all perception checks related to hearing. 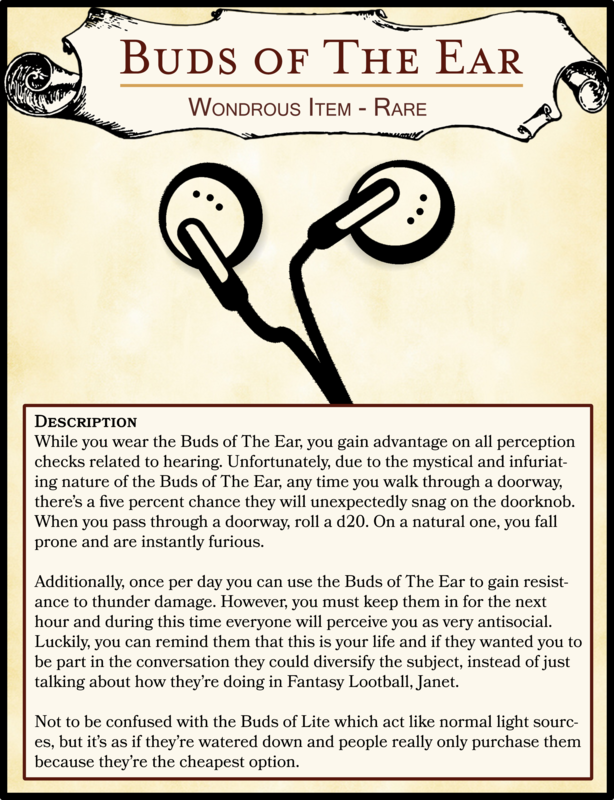 Unfortunately, due to the mystical and infuriating nature of the Buds of The Ear, any time you walk through a doorway, there’s a five percent chance they will unexpectedly snag on the doorknob. When you pass through a doorway, roll a d20. On a natural one, you fall prone and are instantly furious. Additionally, once per day you can use the Buds of The Ear to gain resistance to thunder damage. However, you must keep them in for the next hour and during this time everyone will perceive you as very antisocial. Luckily, you can remind them that this is your life and if they wanted you to be part in the conversation they could diversify the subject, instead of just talking about how they’re doing in Fantasy Lootball, Janet. Not to be confused with the Buds of Lite which act like normal light sources, but it’s as if they’re watered down and people really only purchase them because they’re the cheapest option.